The operators of the MeerKAT radio telescope in South Africa have switched on its first 16 dishes and, pretty much immediately, spotted more than 1,200 new galaxies. If all goes to plan, by the end of next year the facility will have 64 antennae, and will eventually become part of the international Square Kilometre Array (SKA) project. For now, MeerKAT's operators are showing off its “first light” images, which captured data from just 0.01 per cent of the celestial sphere, an area of sky in which 70 galaxies in the distant universe had previously been identified. That number is now more than 1,300. 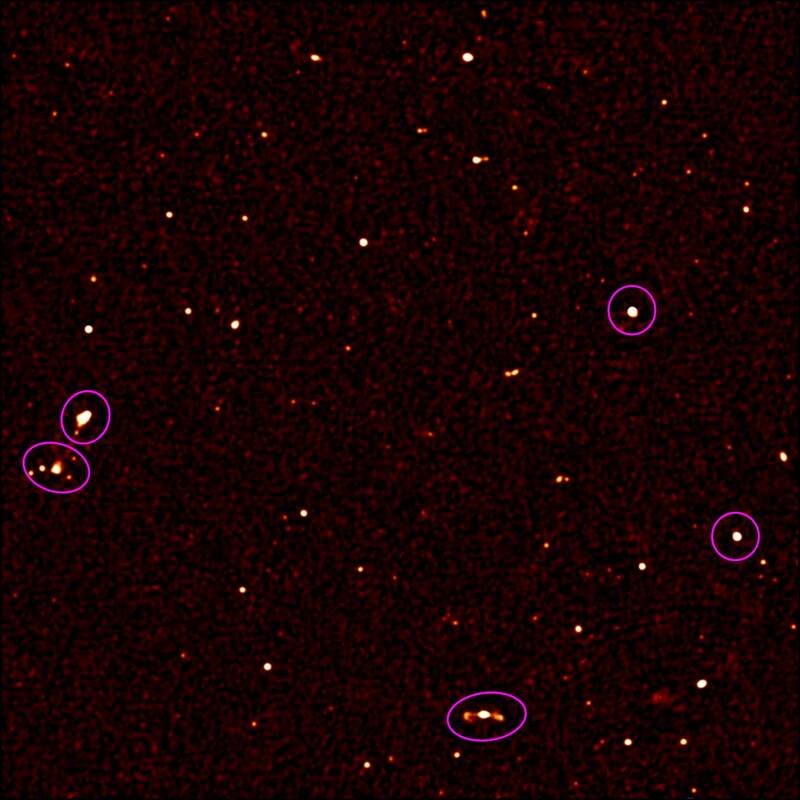 The image below shows part of the first light image, an area of sky about the size of the moon and about 10 per cent of the total survey: the SKA Africa project has helpfully circled objects already identified; the rest are new. Here's just one of the new objects, a massive black hole in the distant universe (a Fanaroff-Riley Class 2, FR2, object). This distant black hole is sucking in matter (bright centre) and firing off jets of near-light-speed electrons. MeerKAT is precursor to Africa's contribution to the SKA project and is being built 90 km from Carnarvon in Northern Cape province. The other major installation of the SKA is happening in Australia, where the SKA Pathfinder is being built near Murchison in Western Australia. That telescope released its first 36-beam images last April.